This hat will be a hit at your next sporting event. It is easy to crochet using worsted weight yarn and size H hook. Crochet it in your team colors. 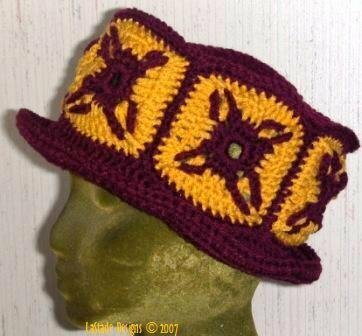 Pattern is easy to read, with step by step instructions. PDF File is Emailed to you within a few hours! This is for a pattern only, not for finished hat. Copyrighted © 2008. All rights reserved. No part of the pattern or instructions may be reproduced in any form, or by any electronic or mechanical means including information storage and retrieval systems without permission from the author. The patterns contained within are copyrighted, but may be used by crafters to produce items for resale provided the pattern is purchased from LaStade Designs. LaStade Designs is the only authorized dealer.